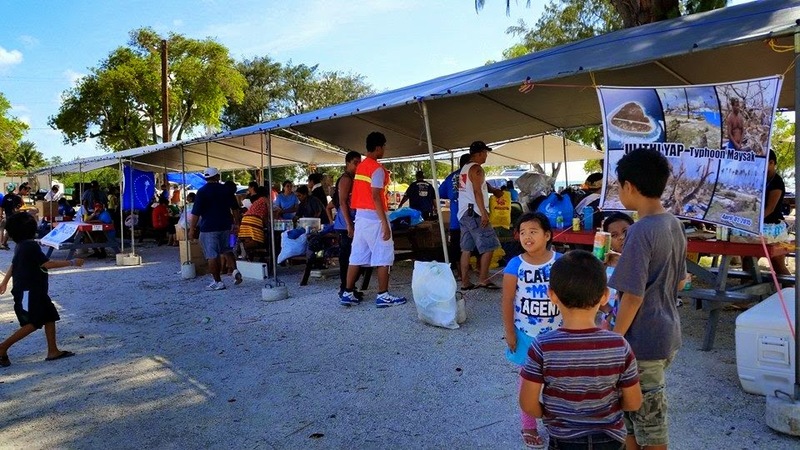 Community members on Saipan during a donation drive activity organized by various groups and individuals in support of typhoon victims in Chuuk and Yap. The photo is taken from a Facebook page for the specific support campaign. FSMIS (April 13, 2015): On April 11, 2015, the Federated States of Micronesia Eighteenth Congress ended its two-day sixth special session. Among actions taken was an appropriation of $1.5 million towards typhoon relief assistance for the FSM States of Chuuk and Yap, and $100,000 for Vanuatu. FSM President Manny Mori called the special session of Congress to consider the ongoing emergency situation caused by Super Typhoon Maysak two weeks ago, resulting in disasters throughout parts of Chuuk and Yap. President Mori submitted a request of approximately $4.8 million with supporting expenditure details. That amount was to be divided up $4,602,705 for Chuuk, $114,858 for Yap, and $100,000 as replenishment of decreed amounts from the Executive Branch. Primarily, the funding would enable a 30-day feeding program in the affected States. In his April 9th communication with Congress before the special session began, the President pointed out that the National Government had a fund balance of $7.5 million available for appropriation. Congress had other plans. On the first day of the session, they repassed C.A. No. 18-123, which had been vetoed on March 2nd, allocating $2.8 million toward economic projects and social programs. Furthermore, at the close of session, Congress also chose to override the President’s item veto of C.A. No. 18-121, earmarking an amount of $3 million for deposit into the FSM Trust Fund, leaving only a remainder of $1.7 million for other appropriations. Apart from the $4.6 for Chuuk inclusive in the President’s request, Congress was also provided a request of $3.2 million submitted by Chuuk State. However, Congress made its decision to only provide an amount of $1.5 million for Chuuk and Yap based on an oral report provided by the Standing Committee on Ways and Means. Immediately after the session, Senator Wesley Simina of Chuuk explained that Congress has provided an amount that can be utilized while a comprehensive disaster assessment is worked on to guide more proper responses. One of his colleagues didn't feel the same way. When asked how Congress got information for the oral report, he simply shook his head and said, "hearsay". The disaster response proposed legislation now awaits the President’s review. The FSM President has issued a Declaration of Emergency and diverted financial, manpower, and technical assistance to Chuuk and Yap, including the deployment of maritime vessels for assessment and early response missions while Maysak was still on the move end of last month for Chuuk, and very early this month for Yap.